I wrote this New Year Resolution poem in 2012 and I am pretty proud of it so I repurpose it every year. I have a penchant for writing silly poems but usually they are quite bad. I liked the way this one turned out and it seems year after year it still rings true. Let me know what you think. You’ll be full of ambition. We have heard it before. To be the best version of you. To those in your heart. Than you could earn or deserve. And joy all the yearlong. Like this poem? It helps me when you share! If it seems you are doing everything right in regards to diet and exercise, but still not feeling your best and seeing the results you desire, lack of sleep may be to blame. Join us for week five of the nine-week holiday challenge to learn how to set your environment for success to improve the quality and quantity of your sleep for best results in life. 10 tips for a stress-free Thanksgiving dinner. Throw out the heavy diet restrictions and enjoy this time with your friends and family. Make better choices when possible, be mindful, and eat slowly to have a healthy and happy Thanksgiving meal. If you spend a lot of mental energy on the things that you should be doing, consider that “should” is a dirty word. Reframe what you should do into what you want to do, what you can do, and what you will do, and let everything else go. Align your actions with your goals and values and you’ll never “should” on yourself again. There’s a fine line between self-care and self-sabotage. Are you taking care of yourself or making excuses? Learn when you need to take a break and when you need to get to work. There will always be another product, another promise, another miracle for sale in the fitness industry. How can you stop falling for the hype and focus in on the behaviors necessary to achieve your goals? Learn more about how mastering the tools and techniques can be the answer. There’s a positive shift in the fitness industry. This trend towards mindset mastery can help us achieve our fitness goals. Make three shifts in the way you think, what you see and what you do on the road to success. Shift your mind to change your life. Learn all about BlogFest, the best-kept secret inside the IDEA World fitness convention. I share my Lea Genders Fitness unofficial and unauthorized BlogFest awards to honor the standout experiences in my epic weekend of learning, community-building and fun. Fitness wearables can be great tools for tracking movement, but can you take it too far? In this article I explore the pros and cons of fitness wearables. Learn how to get the most out of your wearables without sabotaging your results. Are you confused by all the health and fitness information that you read on the internet? Is there too much conflicting information that is hard to sort out? In this article learn how to cut through the BS to figure out what will work best for you and your lifestyle. This is the one of the busiest times of the year. I put together this quick eight minute tabata-style core workout so you can squeeze it in even when you are too busy to exercise. This is also a great core workout to do as part of your warm up before you run or cool down after. We follow the Tabata protocol which is 20 seconds work, 10 seconds rest for four minutes. You can download a free Tabata timer in the App store or on Google Play that makes it easy to time these workouts. I use a GymBoss timer (<-affiliate link) in the #shredshed and at my bootcamps. It makes it really easy to set the intervals. In circuit one you'll perform 20 seconds of the crunch, rest for 10 seconds, then move on the next exercise. Once you complete the last exercise, the side plank, you will repeat the circuit. Do a right side plank on the first time though, then a left side plank the second time. After four minutes rest for one minute before moving on to circuit two. In circuit two you'll start with low plank for 20 seconds, rest for 10 seconds then move on to the next exercise. Once you complete the last exercise, the bird dog, you will repeat the circuit. When performing the bird dog, do right leg and left arm extended the first time through and then switch to left leg, right arm the second time. Give it a try and let me know what you think. Any questions? Let me know in the comments. The lunge is the perfect exercise for runners. It strengthens the glutes and hamstrings while challenging balance and core stability. Give these variations of the lunge a try in your next workout to train to run strong. HIIT the local track for this high intensity interval workout that includes running stadium stairs, 1/4 mile track repeats and strength exercises designed to improve strength, speed and power in runners. Forget doing 100 crunches a day, runners to need to build core strength and stability in all planes of motion.Try this challenging six-moves plank circuit for runners before your next run. How many times can you complete it with perfect form? Enjoy the benefits of strength training for runners with these short and efficient workouts. Work them in your schedule before an easy run as part of a warm up or repeat in a circuit style for a full body workout on a non-running day. Run stronger, faster with reduced chance of injury. Happy Holidays, friends! I want to thank each one of you for taking time out of your busy lives to follow along with Lea Genders Fitness. This blog is my passion project, my dream and my creative outlet. It means a lot to me that you read the the things that I write and that I can potentially help you with your running and strength training questions. To finish out the year (oh boy, did it fly by) I thought I would do a round-up of my most popular content in 2016, in case you missed anything this year. If you came here from Pinterest, you are in good company, a large portion of my traffic this year is from Pinterest. I hope you will stick around, subscribe and let me know what else I can offer you in your running and strength training journey. Here's to a strong and fast 2017! If you are wondering how my year went on a personal level, I did a 2016 Year-in-Review post over on my Running with Ollie Blog. Like this post? It helps me when you share! Saving to Pinterest is also an effective way to show your support! How else can I help you? Any questions? Leave a comment or send me an email. To improve in running, sometimes we have to set aside our ego and take a step back and unlearn poor movement patterns to run forward more efficiently. Running is a skill, and skills can be learned and improved with frequent drills, practice and exercises. Follow along as I experiment with the Pose Method of running. If you are considering running the BMW Dallas marathon, the time is now to start training. You don’t need me to convince you that running is awesome, this is post is about the five reasons to the run the Dallas Marathon that have (almost) nothing to do with running. As runner we have a lot of shared experiences, the good, the bad and the embarrassing. Get out your virtual bingo pen to play runner’s bingo, and see how long it takes you to yell B I N G O ! Learn more about how to run a safe and effective run streak, and how to know when it’s time to stop. In case there is any dispute, I wrote a song about running to convince you that Autumn is the most wonderful time of the year. Won’t you sing along? This post contains affiliate links which means if you click on a link and make a purchase I make a small percentage of the sale with no extra cost to you. It helps support the running (pun intended) of this blog. I love my FitBit. In fact, I am a little obsessed with it. I made a commitment to myself this year to walk or run 10k steps every single day. It's one of my non-negotiable bare-minimum goals for each day. A FitBit can be a great motivator to move but it is easy to make mistakes that can take you farther away from your fitness goals, rather than closer. Your FitBit is supposed to make you healthier, not crazier, Right? The number of calories burned during an activity can vary drastically from person to person. There are a lot of factors that go into it that simply can't be captured 100% accurately on your FitBit. You should consider the calorie burned on your FitBit as a general guide, not as an exact science. It is safe to assume the calorie burned on your FitBit is over-estimated. If you eat to the calories that your FitBit says you burned, you may end up overeating for your activity level. Steps are great. They are a way to track how much you are moving, which is important, but there are plenty of important facets of fitness that don't require steps. Lifting weights, stretching, practicing Yoga and foam rolling are all beneficial fitness activities that won't rack up many steps. If you neglect certain fitness activities simply because they won't increase your step count, then your FitBit may be holding you back. Yeah, I like to win too. But if you stay up an extra hour to walk on the treadmill to beat some guy you never met named Jose in your FitBit challenge, you may be taking this competition thing too far. (Resemblance to actual events in my life are purely coincidental. Or not.) Yes, the challenges can help motivate you to move a little more, but they should not take over your life. Damn you Jose (shakes fist in the air at person I never met). I was very proud of myself. In 2016 I took 10K steps every single day from January through October. Then one day I was lifting a bin of medicine balls out of the my truck after boot camp and I hurt my old lady back. I was sort of devastated. I could barely move, let alone walk 10k steps. After 10 months I had to let my 10K a day streak go. I knew it was more important to let my back heal than try to fight through five miles of stepping. I was out of the game for three or four days, but when my back healed I jumped back on my streak. Now I just say that I walked 10K steps every day that I was physically able. If you are concerned about meeting your step goal when you are injured or sick then you may be taking it too far. The FitBit can provide valuable feedback, but what is important is how you use that feedback. Will you use it to motivate yourself, to make new goals and to push yourself further? Or will you use that feedback to feel bad about yourself? My friend left her FitBit on the charger at work over the weekend and joked "How am I supposed to feel bad about how few steps I am getting in compared to my friends and see how poorly I sleep without my FitBit." She was joking, but she makes a good point. If you use the feedback from your FitBit to compare yourself to others or feel bad about yourself then your FitBit may be doing more harm than good. Sometimes the healthiest thing to do is walk away from all the technology for awhile. Sometimes my 10K steps come easy. Some days they are hard-earned. I am the first to admit that I have spent many late evenings walking circles in my backyard or around my house because I was several hundred steps short of my goal. Walking in circles may sound crazy, but I try to balance my FitBit goal of 10K steps a day with my other fitness goals and my lifestyle. 10K steps a day is a fantastic goal to pursue but it is certainly not the most important thing in my day. Do you have a FitBit or other activity tracker? Are we FitBit friends? Find my email here and add me as a friend if you want to connect on FitBit. Hello, friends. I am excited to tell you that I just registered for the Dallas Rock 'n' Roll half marathon in March. If you want to run it with me, I have a discount code (code:LEAGENDERS) from the rock 'n' roll marathon series because I am a 2016 rock 'n' blogger. This code worked for all 2016 races and works for some of the early 2017 races, including Dallas. Would you like to train with me? For Workout Wednesday I am thrilled to share my personal 12 week half marathon training plan. I haven't been running long distances much this fall/winter so it is time to start training for my half marathon at the end of March 2017. Following a training plan is a great way to stay motivated to exercise well into the new year. I starting building a training plan to get myself back up to 13.1 miles. I am happy to share it with you but as always, there are a few caveats. First of all, I am a certified running coach, but I am not your running coach. Since I don't know your exercise abilities, injury background or medical history, please see your doctor before beginning any new exercise program. This program is intended for an advanced beginner or intermediate runner. You should be able to run at a conversational pace (meaning you can hold a full conversation without gasping for breath while running at a slow pace) before starting this program. Because I am who I am (the strength training for runners coach), this half marathon training plan may not look like your typical plan. My plan includes strength training days because I think they are really important. While running will be my priority, I will still find a day or two each week for strength training. A full body strength training day and a core day once a week should be sufficient. Even though I am an experienced runner, it is still a good idea to start any plan with a base building period. Since I haven't been running a lot lately, I gave myself four weeks to build a base. Depending on your current fitness level, you could shorten this phase. All runs in this phase should be done at conversational pace. We will slowly start to build our long run in this phase. When I talk about strength in this context, I am a referring to running strength. We will start to incorporate hills and tempo runs into our workouts. The speed phase for half marathon training includes running intervals. I generally recommend no less than 1/2 mile intervals for half marathon speed work. We don't spend a lot of time doing shorter intervals for half marathon training. This is when we will back off the milage and long runs to taper in order to prepare for race day. You may notice that that there are rest days, easy run days and/or core days immediately following high intensity days. We always want to allow low intensity days like core work and conversational pace milage after high intensity days to allow our bodies to properly recover. Remember that our bodies adapt, get stronger and faster during rest, not during the workout. Allowing the proper recovery is an essential part of this half marathon training plan. I included a PDF printable download at the end of the post so that you can print out the half marathon training plan and fill in your actual mileage each week. Running plans should always be dynamic, meaning that you should be willing to change and adjust as needed along the way. If I was your running coach, we would review your log at the end of the week and based on how you felt and performed, we would make adjustments if necessary. It is important when following a plan from the internet that you don't look at it as a rigid all-or-nothing plan. The perfect plan is one that fits into your lifestyle. If you feel you need an extra rest day after a long run, then take it. If you have to swap a running day and a strength training day because you can only get to the gym on certain days, then swap them. If you need to do your long run on Saturday instead of on Sunday, then do it. As a coach, I wouldn't expect you to complete the plan exactly as written for 12 weeks. Life happens, things change. This is not an excuse to blow-off the plan, but rather permission to make appropriate changes as needed. The most important part of the plan is to build the long runs and weekly mileage slowly over time. I caution you not skip any rest days or add more mileage to the plan unless you are an experienced runner who has completed many half marathons. The mileage build-up is strategic. Doing too much too soon is one of the biggest mistakes runners make. Are you ready to start training? 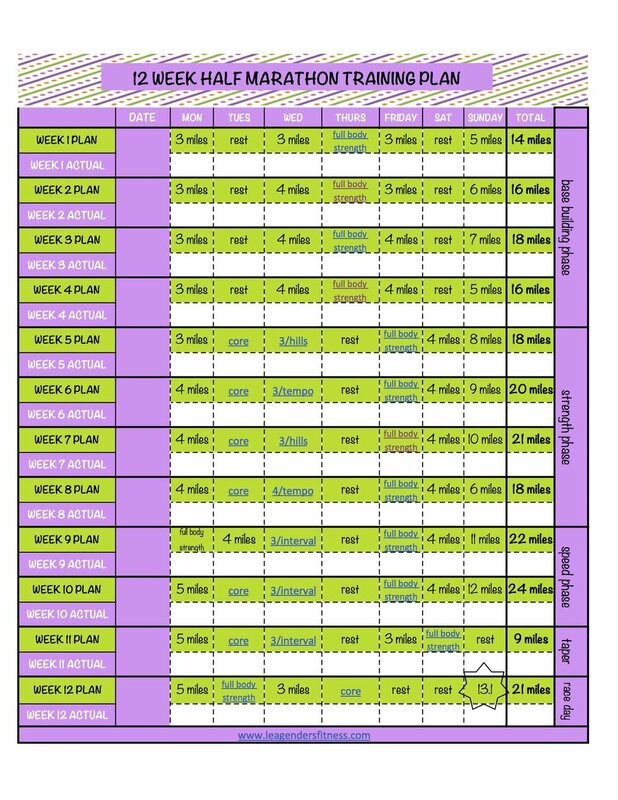 I invite you to download my 12 week half marathon training plan printable PDF so you can log your progress along the way. Good luck with your training. As always, let me know if you have any questions. Download the training plan PDF.